Includes 2-5 Watts, 110V, 200-500 Lumens, 60,000 Hour Life, 25" Goose Neck, C-Clamp Mount, 60% Less Heat Than Halogen, 90% More Efficient Than Incandescent. Two easy to reach light settings. Choose the brightness that is best for the task at hand. 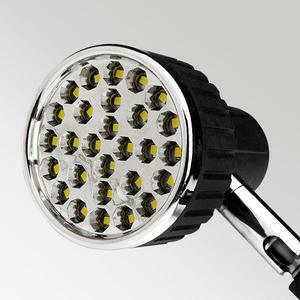 2-5W (200-500 lumens). On/off switch on the base. Our new 9000C light fixture uses 28 SMD-LEDs (surface mount and light emitting diodes) and advanced circuitry to produce a natural bright light that is easy on the eyes and reproduces colors as they truly are. LEDs are the most efficient and lowest cost to operate lighting available. 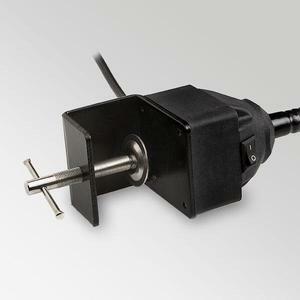 The 9000 series are rated for up to 60,000 hours of use. Compared with halogen bulbs, our SMD LEDs produce up to 60% less heat, and are not affected by vibrations, making them the perfect choice for installing on equipment. Compared to traditional incandescent bulbs, 9000C is over 90% more energy efficient. A proprietary honeycomb lens cover insets the SMD LEDs by 5 mm so there is no chance of the light shining in a passerby's eyes. 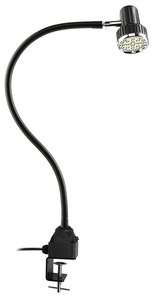 The 9000C comes with a metal (commercial grade) c-clamp that allows the light to be easily moved.